So last night I was looking at yarn online (that sounds kinda sketchy doesn't it?) when I realized that I need to have some sort of barrier to keep me from buying loads of yarn. "What could I do?" I thought to myself. "Could I motivate myself to exercise and as a reward get yarn? No, no, my head is all congested from the pollen, exercise is out of the question (or so I explain it away to myself). Hmmm, look at all those books I have on my bookshelf. It is going to be a pain transporting all of them to Florida. I should read them and either sell them or give them away now. Wait a minute! I have an idea!" Indeed, I did have a good idea last night. I have decided that for every page of a book (non/fiction novel NOT knitting pattern books unfortunately) I will put a penny into my yarn and knitting fund. Of course this means that I will be using precious yarn time for reading, but I think it will be worth it in the end (since I will be able to buy MORE YARN!). Besides coming up with brilliant ideas last night, I also got a flickr account, so now you will be able to see all of my finished projects. I am sure if you have been reading this blog, it will seem like I never finish anything, but lo and behold, I do finish a project every once and a while. I also will put up the Lopi and Magic Stripe yarn battle royale for being the Knitting Olympics project (I filled up my picture quota for the month, so you will have to wait). Of course, as you know I had to drop out, but that crazy night of yarn wars will be in my memories forever. 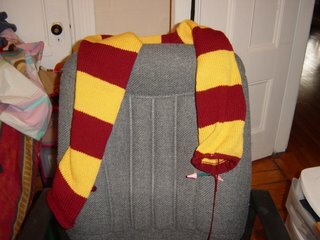 As promised, here are pictures of my WIPs (no, not all of them, just the Harry Potter scarf and the (misnomer) SCID scarf (I decided to work on it in the clinic while I wait for potential participants now). 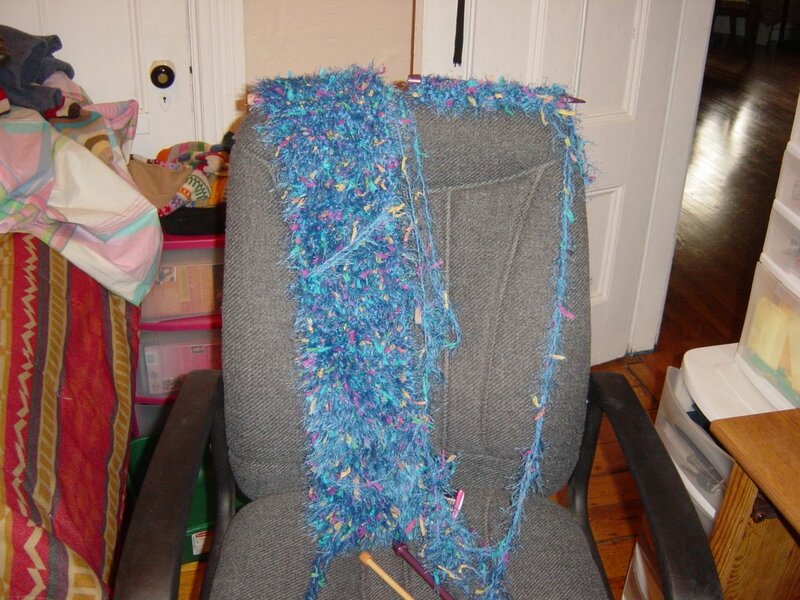 A quick note about the SCID scarf, the needle on the right is the "real" scarf. The needle on the left has the scarf I made with the size 15's. I am in the process of reknitting the scarf now.